In 1967, Ernesto Che Guevara (1928-1967) left Cuba for the last time as he engaged in his plan to spread social revolution across Latin America. Fueled by his beliefs in Marxist-Leninist ideology, he was determined to see Latin America free from the grip of Yankee capitalism. On October 8, 1967, he was executed by the Bolivian military following his capture several days later. His death pushed him into martyrdom and to this day, he is by far, the most iconic revolutionary, both loved and loathed. His actions on the battle field and later as part of the Cuban Government have produced enough material for several books. But what was often overlooked was his role as a husband and father. When he departed Cuba and began his final expedition, he left behind a wife and five children from two women. His youngest child was an infant when he left. His widow Aleida and his children have carried his legacy, never letting us forget who he was and what he stood for. Che Guevara continues to arouse interest and actor Benicio Del Toro took on the role of Che in the 2008 biopic of the same name. And as Cuba slowly moves closer to social reform and the end of the Castro regime, his name will arise in discussions about Cuba’s difficult past. Many of the figures that took part in the Cuban Revolution are no longer with us, having departed this world for the next life. Raul Castro remains one of the few from the old guard and carries the spirit of the revolution as he oversees the country that his brother transformed. 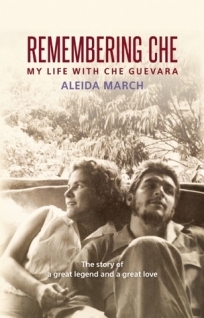 As much as I could go on about Che, the story at hand belongs to his widow Aleida and these are her recollections of her life with him. The two met during the guerrilla campaign and were married in 1959 following Che’s divorce from his first wife Hilda Gadea (1921-1974) with whom he had a daughter, Hilda Guevara (1956-1995). Aleida would go on to give him four children, all of whom resemble their iconic father. To the public, he was the key piece to the battle at Santa Clara which changed the war and to others, the man responsible for the executions at the La Cabana prison. At home, he was dad and as Aleida shows us, a typical father trying to be a good husband who adores his kids. Following the expulsion of Fulgencio Batista, Che took on several jobs, typically working from Monday through Saturday. It has been said that he sometimes slept in his office. And even on Sundays, he worked for several hours before going home to his family. For most women, this would have been too much, but for Aleida, she remained dedicated to her husband, his beliefs and the revolution they both took part in. Those who might be looking for a revelation will not find it here. The book is mainly about their life together as they bring several children into the world. Che was dedicated to his cause and revolution is a part of their daily lives. Aleida’s anecdotes highlight many instances where his rigid beliefs interfered with their daily lives. And to her credit, she never stopped loving him nor did she remarry after his death. Undoubtedly, the crux of the book is how Che came to leave Cuba for the last time and how Aleida handled his decision. Her disclosures about her feelings regarding Che’s decision to leave might surprise some readers. She is very frank and clear in her thoughts but I could not help to think that she was beyond dejected to see him leave. And for Che, leaving his family must have been one of the hardest decisions he had ever been forced to make. Aleida very vividly and thoughtfully, explains how Che came to make that fateful decision. Today we have the luxury of asking what if? What if he had never left Cuba and stayed there with his family? Would he have become the revolutionary icon that he is today? We will never know those answers but through Aleida’s fond memories, we can see the other side of Ernesto Che Guevara. Posted on July 16, 2015, in Biographies and tagged Cuba. Bookmark the permalink. 2 Comments.